Hello fellow Bronze Agers, and welcome to another edition of my investigation of the depths of DC’s Bronze Age books. We have an interesting pair of comics lined up for today’s article, one sci-fi and the other supernatural. As has became a sad routine, I dreaded this comic, but I was very pleasantly surprised when I it. Some of the trademark excesses of this series are still on display in this month’s issue, but I think this must be the most successful story of this run, as a story. Ironically, as the type of thoughtful investigation of important social issues that O’Neil set out to deliver, it is, perhaps, the weakest. It’s an interesting contrast. To his credit, O’Neil displays more subtlety and nuance than has been his wont in this book, and even Green Arrow doesn’t come off as too insufferably self-righteous. Unfortunately, taking the action off the Earth robs the comic of the social consciousness it has been trying ohh-so-hard to cultivate. Ohh, it starts on Earth alright, with our Hard Traveling Heroes continuing their cross-country trek in their old truck. Ollie even broaches the very hopeful topic of their getting off the road for a while, but that will have to wait as a near miss by a big rig sends the trio off a bridge and into a river. To get out of the drink, they climb aboard a ship transporting toxic waste. I was pleasantly surprised to see that: A) the poor schlubs having to transport the stuff were not mustache twirling villains, just decent, hard-working sailors trying to do a job and do it right, and B) the stuff was on the way to be disposed of properly rather than being dumped into the river for poorly defined reasons. Are we sure this is really a Denny O’Neill script? Unfortunately, the ship’s boiler blows, almost killing Green Lantern and setting the scow ablaze (O.S.H.A. must be the most lax and laid back organization on the planet in the DC Universe). The Guardian is presented with an interesting moral dilemma. He has enough innate power to either save the ship or take Hal to a doctor, but not both. The logical (hello there, Spock) choice is to protect the lives of the crew and the health of the environment by saving the ship, or at least that’s how it’s presented. Instead, the immortal, changed by his time on Earth, chooses to save his friend. It’s actually a nice moment, but it is undercut because it strikes me as a bit of a false choice. Yeah, it’s bad to let the toxic sludge get loose in the water, but the sailors are not in immediate danger, and the life of a human being is of great value. It seems strange that even a being with as long-term a view as a Guardian would take such an ecological incident as more important than a human life. Well, in another pleasant touch of nuance, the crew has to toss the waste overboard because it is flammable, but O’Neil goes out of his way to show that they do so unwillingly, aware of the cost. It’s actually a pretty effective scene. 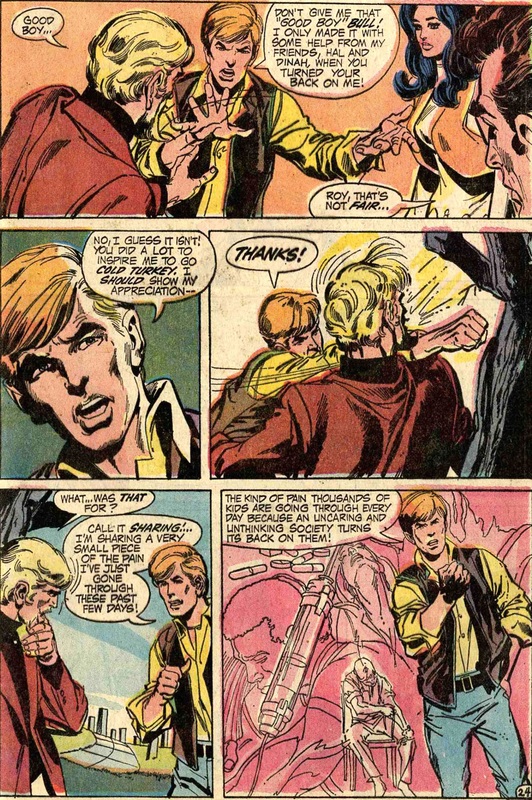 Meanwhile, the Guardian’s swift action saves Hal’s life, but their happy reunion with Ollie is short-lived, as the immortal’s peers are none too happy with his choice. They inform him that he’s transgressed and needs to be judged. Green Arrow responds with his trademark tact and diplomacy, telling a race of god-like beings that the Guardian’s choice was “the only human thing to do!” I’m sure that carries tremendous weight. Thanks Ollie; you’re a big help. The traveling trio are sent to a world called Gallo, which is like the intergalactic Supreme Court. This is actually one of my only real problems with this issue. It doesn’t make much sense that the Guardians would farm out their justice system to anybody else. They aren’t exactly shy about their abilities or bashful about their judgements. I’m wondering if this place ever showed up again, because it really doesn’t fit in with the Lantern Corps. mythos. Anyway, when they arrive, a robotic bailiff demands that they surrender their weapons, and when the Emerald Archer resists, the electronic enforcer insists, violently. 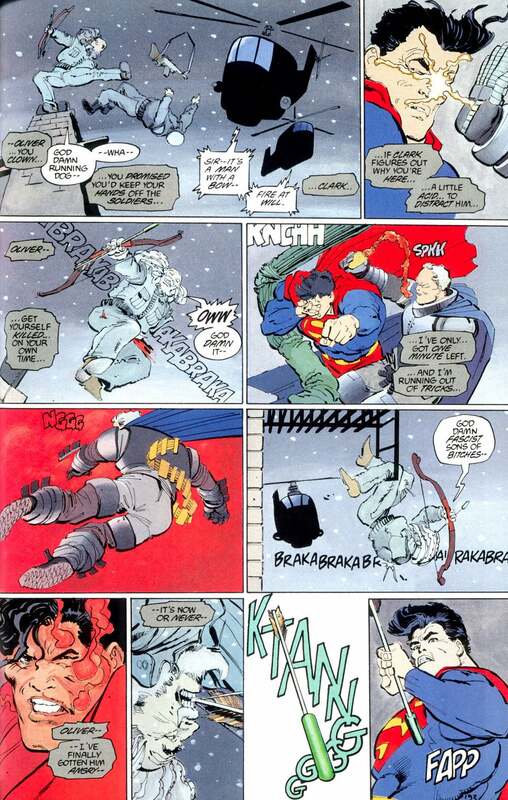 Here we see a very nice piece of storytelling, where Adams and O’Neil work together in perfect sync. Arrow uses the distraction of the fight to snap off one of his arrows’ warheads, and the art conveys this perfectly but unobtrusively. You hardly notice it if you aren’t looking for it. This will, of course, become important later on. Apparently, things on Gallo are not what they should be, and both the Emerald Crusader and his erstwhile boss notice, but it is too late as they have already been disarmed and captured. Instead of the customary tribunal, they are greeted with one cruel and vicious judge who proceeds to give them a trial that could have been plucked from the pages of Kafka. The accused are gagged and summarily sentenced to death on false evidence, a sentence delivered by a jury of robots! In the holding cells, the green-garbed heroes discover the real Tribune of Gallo, whose power has been usurped by their former master mechanic, who has some type of hangup about the superiority of robots to flesh and blood. Unfortunately, that angle really doesn’t get much development. The guy is crazy and on a power-trip, and his pro-machine agenda doesn’t really provide much more than window-dressing for the story. 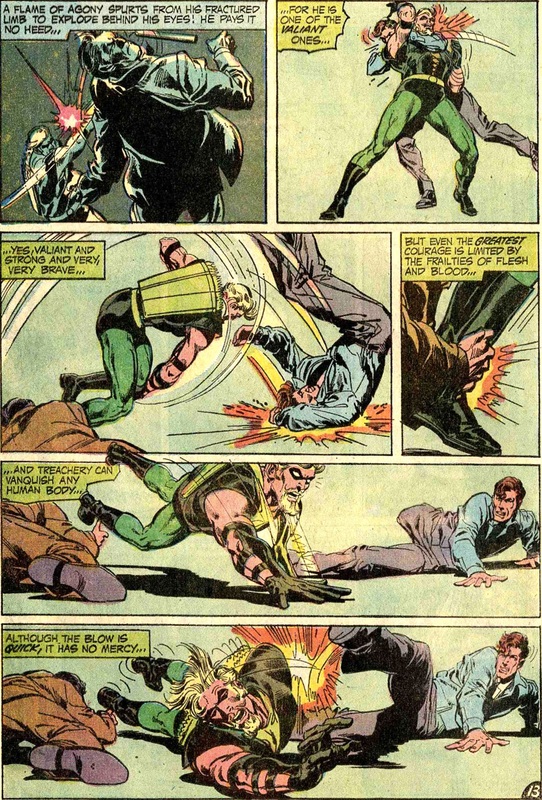 Nonetheless, O’Neil delivers a great scene as Green Arrow rapidly strips their cell to create a makeshift bow, arming the arrow with his salvaged warhead. It serves ably and destroys their robotic jailer, allowing them to escape and recover their weapons. 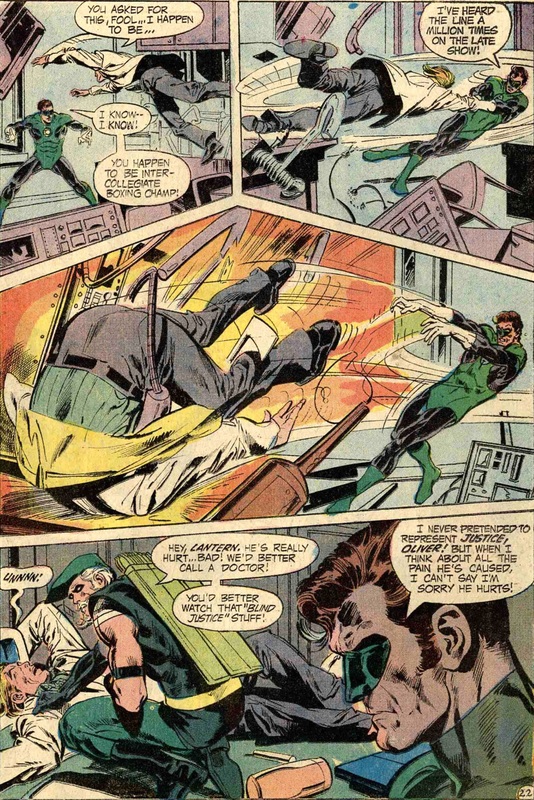 It’s a great character moment for him, though it continues the process of elevating Ollie at Hal’s expense. In the meantime, the Guardian’s death sentence is being carried out as he is slowly sealed in plastic, only to be rescued at the last minute by our emerald heroes. It’s a lovely, dynamic sequence illustrated beautifully by Adams, but it also includes the other false note of the issue. Hal has a moment of conflict as he goes up against the judge, thinking to himself “it’s hard–very hard for me to use my ring! Though the judge is mad, I’m conditioned to respect the authority of the law!” Good heavens! It’s not like Hal was in the SS! He’s not a brainwashed cultist; he’s a former soldier, daredevil test pilot, and space cop. To a certain extent, we’re all ‘conditioned’ to respect authority. It’s part of growing up in an ordered society, but most of us don’t get paralyzed with indecision when we encounter something that is obviously and grossly unjust. It’s not like this judge is even the proper representative of the court on this world. Hal just freed those guys from a cell, so the law is definitely on his side! It’s just a stupid moment, and it makes the character seem incredibly dense to boot. I understand what O’Neil is going for, but as with so many aspects of this series, the execution is just off. Fortunately, our heroes manage to get ‘the old timer’ out of his plasticine tomb in time, and he notes that he simply held his breath, having learned from humanity that “where there is life, there is hope.” That’s one of John Carter of Mars’s favorite phrases, and one I’m quite fond of too. It’s a good lesson to learn and certainly a truth that humanity bears out. Despite our flaws, we are awfully hard-headed (which can occasionally be an asset). The Guardian decides to stay behind and receive a judgement from his fellows, but he sends Hal and Ollie back to Earth and the adventures that await them. This is definitely a much better comic than many of its predecessors. The plot works, the threat is actually pretty legitimate, and the alien setting is a lot more fitting for the power ring wielding Green Lantern than random small towns in the American countryside. The characterization of the protagonists is, on the whole, better. 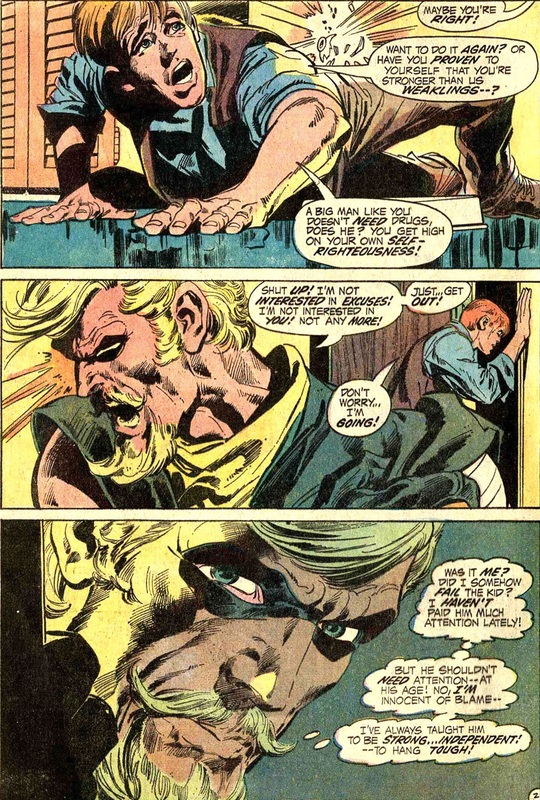 Even Green Arrow only gets one short self-righteous speech (thus fulfilling his contract). The Guardians’ moral dilemma is interesting, even if it feels a tad forced. It does make sense that a being used to seeing the biggest of big pictures, galactic order, would struggle with the emotional attachment of living life on a small, personal scale with the two heroes. Yet, the comic definitely loses something by taking its action off-world as well. While an examination of themes of justice is possible in a story set among the stars, it loses any real social relevance by having no connection to the more terrestrial problems of injustice found under the Sun. I know I’ve been hard on this series, but it is important for us to remember, and especially for me to remember as I write, that what it is doing is well and truly unique for its time. This book was like nothing else of its day, and nothing really like this had ever been done before in comics. As ham-handed and tone-deaf as it often was, it was also groundbreaking and incredibly innovative. I’ve probably not been giving O’Neil enough credit for the risks he took and for overcoming the obstacles he must have faced. Nonetheless, a story is good or bad, regardless of context. It either works as a story or it is flawed, and noble intentions do not a successful plot make. I’m trying to deal with these tales both as stories and as cultural artifacts, so I’ll try to balance my coverage appropriately. Make no mistakes, though. Many of these stories are not particularly good, as stories. Something can be important without being actually good. So, all things considered, I’d give this issue a strong 3.5 Minutemen. It loses points for Hal’s inane inner conflict, but only just. This is fun story with a bit of a flawed resolution. Notably, we’ve got Mike Sekowsky handling the writing chores this month, and he varies up the formula a bit to interesting results. Instead of what has become the standard, with a frame tale setting up stories narrated by both the Stranger and Dr. Thirteen, this issue just gives us Thirteen’s flashback in addition to the frame tale. It gives both of them more room to breathe and is definitely a step in the right direction. I think we’re seeing this book continuing to find its feet. I’m hopeful that it will soon settle into a really strong run. This issue takes us down to an unnamed Caribbean country that is a clear analogue for the mysterious island nation of Haiti, and of course, that puts our heroes up against the dark forces of Voodoo! Now, I know, you’ve probably heard how Voodoo in real life has very little in common with its portrayals in popular media. In fiction, it is the religious equivalent of the Nazis, the perfect theological antagonist, spooky, enigmatic, and full of dark rituals. In reality, it’s a religion that’s much like others of its kind, shamanistic and made up of an amalgam of Christian and African beliefs and practices. We’re dealing with the most sensational type of portrayal here, but I was fascinated to discover that the sinister influence of Voodoo in this story is actually loosely based on real history. In 1970, the Haitian dictator François Duvalier was in the last years of his reign, a reign that he had supported by co-opting the local forms of Voodoo. He claimed to be one of the Ioa, or governing spirits of the world, as well identifying himself as Jesus and God himself, just to up the ante on the blasphemy all the way to 11. He used Voodoo and dragooned its leaders into his service in order to gain spiritual as well as political control over his subjects. That’s a pretty perfect setting for a spooky Phantom Stranger adventure and a dystopian nightmare! And the story doesn’t disappoint. In Haiti we discover professional wet blanket Dr. Thirteen coming to the aid of the country’s president. Interestingly, though he looks like Duvalier, he’s actually the good guy here, trying to improve his country and being opposed by shadowy and nefarious Obeah Men (Voodoo sorcerers). It seems his assistant has died without a mark on him after receiving a Voodoo warning. The President tells Thirteen that he’s been unable to make any headway against the Obeah Men and asks for his help to discredit them so that the people will stop supporting the charlatans. He offers to take the good doctor to a ruined fortress where the Voodoo ceremonies are held. On their way there, Thirteen tells the Haitian head of state about a similar case. Here’s our interpolated episode, which is actually a pretty standard story. I’ve seen this plot adapted in a few different places, including on the radio show Escape. I imagine there is a short story that has served as the originator, but I haven’t bothered to track it down. Anyway, it’s a pretty standard setup. A colonial officer in Africa runs afoul of a Voodoo priest and is forced to kill him. With his dying breath, the man curses the officer, and he lives in fear of that curse ever after. Eventually, he sees the man again and is given a token of warning, in this case, a Voodoo doll with pins in the legs. The victim’s fear and belief create a psychosomatic reaction (he loses the ability to walk), and there is a threat of death. 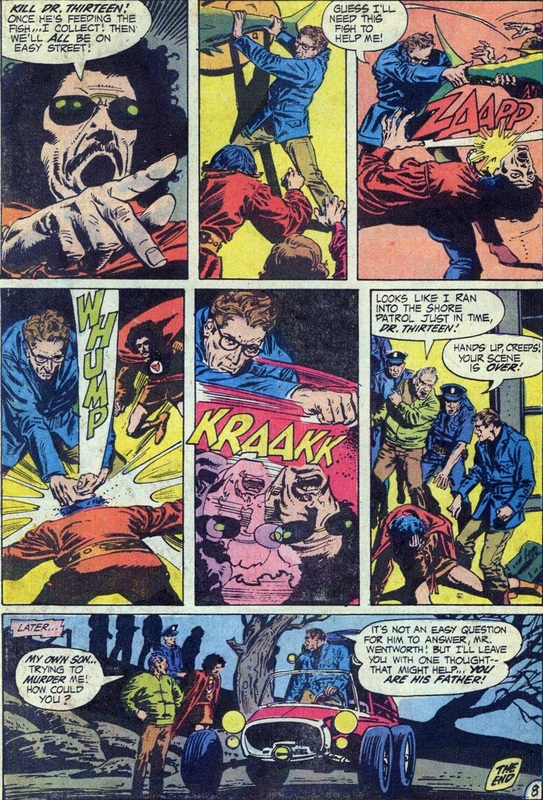 In this instance, the worst is prevented by Dr. Thirteen discovering that the man’s nephew had faked the second encounter and used a recording to hypnotize his uncle in his sleep. You know, people are always doing that in fiction, and it seems to require a huge amount of luck. All it would take is one bad dream, midnight snack, or trip to the bathroom to reveal the scheme. But I digress. There’s a reason that plot has been adapted multiple times; it’s a good one, and Aparo’s beautiful art makes this a memorable version. Back in our frame tale, guess who makes an appearance? It’s the Unnecessary Teen Gang. At least Sekowsky lampshades the absurdity of their showing up in Haiti, as they explain they mysteriously won a trip, and we can assume this was orchestrated by a higher power…for some reason…despite the fact that they contribute absolutely nothing to the plot. Dr. Thirteen spots the kids in a market and flips his lid. He leaps out of the car and starts demanding that they tell him where the Stranger is, arguing that he’s never far away from them. 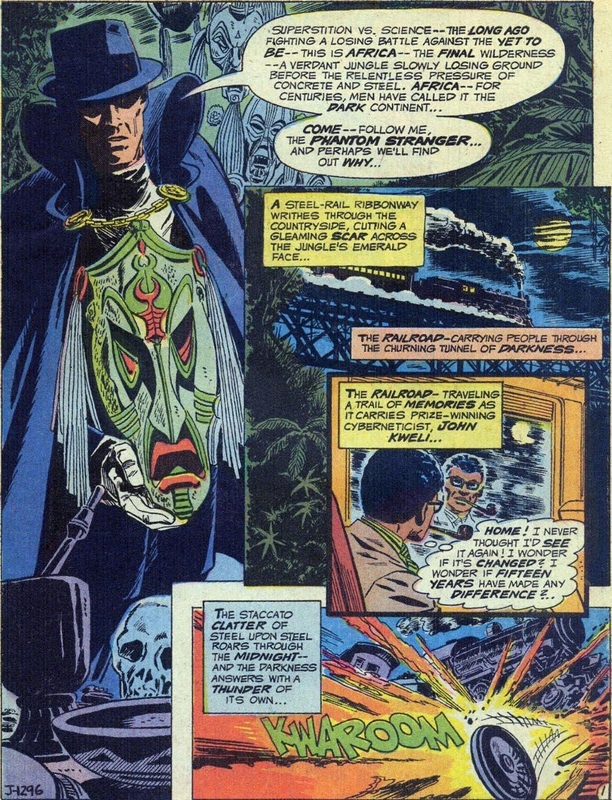 Just as they tell the overly excited ghost breaker that they haven’t seen the man with the awesome medallion, the Stranger himself appears, in the limo no less. Immediately, the President proves more sensible than the supposed scientist, as he doesn’t discount any possibilities out of hand, willingly hearing his visitor out. The gang all head to the ruined fortress, and once there they they find a ceremony in full swing, as well as a pair of strangely garbed figures in the midst of the dark ritual. One is revealed, of course, to be Tala. The other is the enigmatic Obeah Man. 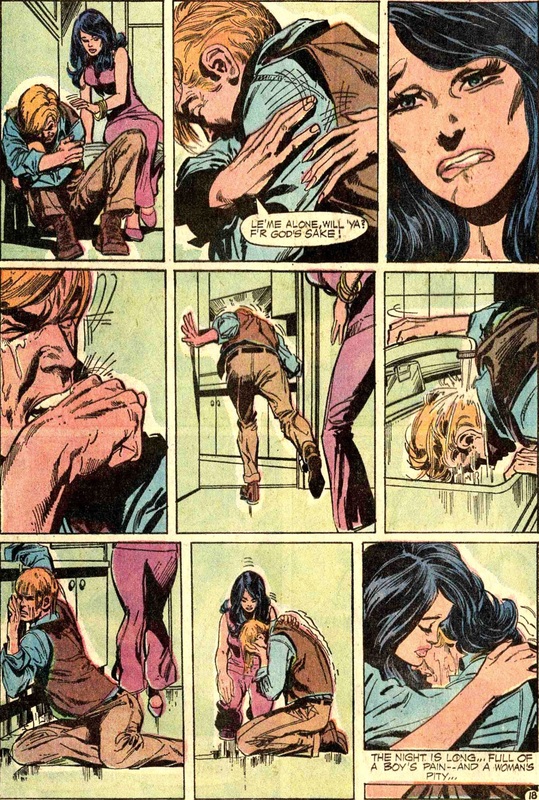 And here we have the big weakness of the issue and one of the very few failures of Aparo’s art. The Stranger leaps at the Voodoo priest and socks him, and then…something happens. The art just doesn’t quite manage to convey the action, and the whole thing is wrapped up in a single page. The Stranger grabs some type of jar called the ‘Seal of Solomon‘ (a symbol with historical and occult significance, figuring prominently in medieval lore about Solomon’s extra-textual magic powers) and the Priest sort of dissolves, and then, I guess, turns into a bug. The Stranger slaps him into the jar, and tosses it into the sea, prompting Tala to bug out in response (sorry!). Confusing or not, that fourth panel is still cool looking. It’s not much of a showdown. Anticlimax can be quite effective, but the whole thing is so vague and the action so unclear that it just feels unsatisfying. Once again, Dr. Thirteen accuses the Stranger of having faked the whole thing and being in league with the villains of the piece, but the President demonstrates a broader mind, thanking the mysterious champion for his aid. Of course, the Stranger disappears, leaving Dr. Thirteen cursing the empty air once more. This is a fun story, and the historical background I discovered about it makes it all the more interesting for me. I quite enjoy that the Haitian president is wise enough to insist that a truly rational man must not discount anything out of hand, all while ‘ol Terry rages at the evidence of his own eyes. 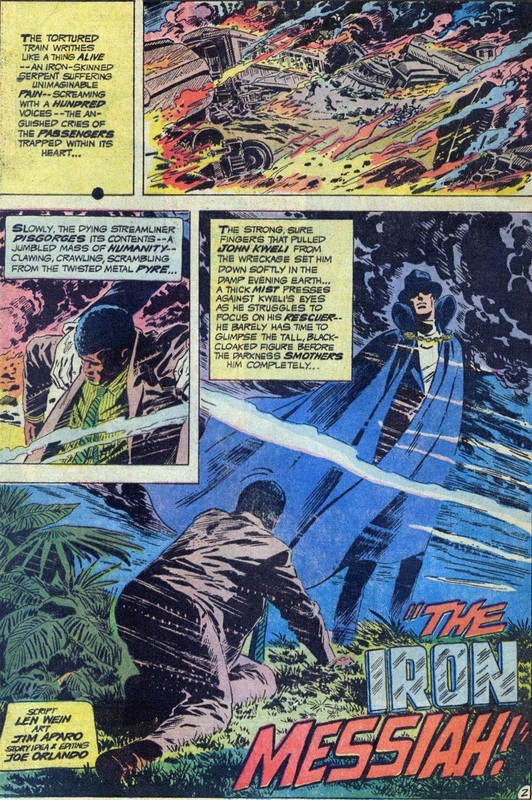 Aparo’s art is beautiful and moody as always, nicely evoking the exotic locale of the story. The narrower focus of this issue allows for a great development of the main plot, but unfortunately the digressions with the Unnecessary Teen Gang takes up some space that would have been better used on the Obeah man. That vague final confrontation is rather disappointing, weakening a promising story. Fortunately, the interpolated episode is pretty good, so that helps balance out the flaws of the frame tale. I suppose I’ll give it 3.5 Minutemen, though that might be a tad generous. It has its problems, but it is plenty entertaining and I just find the creepy background of a despotic state ruled through fear and a co-opted religion adds a lot of flavor to the issue. 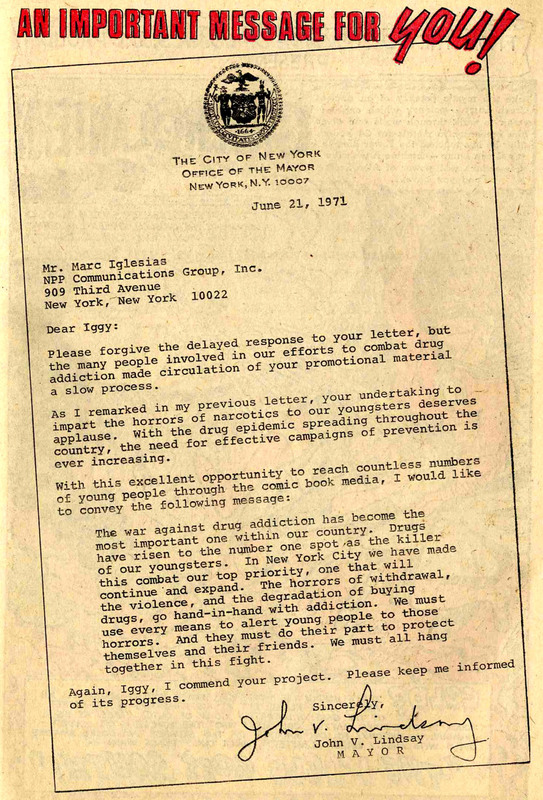 The letter column actually includes a note from the editor about how a recent visit to Haiti served as the inspiration for this story, which confirms the setting. The letters themselves are full of effusive praise for the new direction of this book. Notably, most folks seem to share my opinion of the useless teen gang, but people are split on Dr. Thirteen. Everyone seems to recognize that they’ve got something special here, though. I can’t wait to see what’s next! Well, that’s it for this post. I hope y’all found these commentaries interesting. I know that I found a lot in these two issues to sink my teeth into, despite their flaws. We’re definitely seeing a lot of the changing face of comics with these two books. They are almost a microcosm of the Bronze Age, pushing the standard boundaries of comics in themes, content, and style. I hope y’all will join me again soon for another step in our journey Into the Bronze Age!